Ten years ago my travels brought me to Blackgang Chine, and despite a good day I figured that it would be the only visit in my lifetime. The requirement to get there by ferry rendered a return trip more trouble than it was worth without the addition of a new credit that seemed unlikely to happen in the foreseeable future. When one subsequently turned up at the park down the road I took a brief look at organising another trip, but the cost of travelling independently pushed it a long way down the priority order. An organised event with the European Coaster Club made a return visit much more appealing, thanks to a reduced cost and a chance to spend a day with friends. Our visit today began with a talk from the park manager, who gave us a brief history of the facility and in particular its roller coaster. We learned that the first credit at the park was built by Westech, but that Tornado never opened to the public due to it not meeting British safety standards. The park won the subsequent legal case, netting one million pounds in damages in addition to the cost of the coaster, and a good chunk of that money helped pay for Cliffhanger. Today the ride was running fairly well, apart from a fairly nasty clunk half way up the lift hill, though the forces did seem somewhat weaker than they were when the ride was new. We did four laps before moving on. 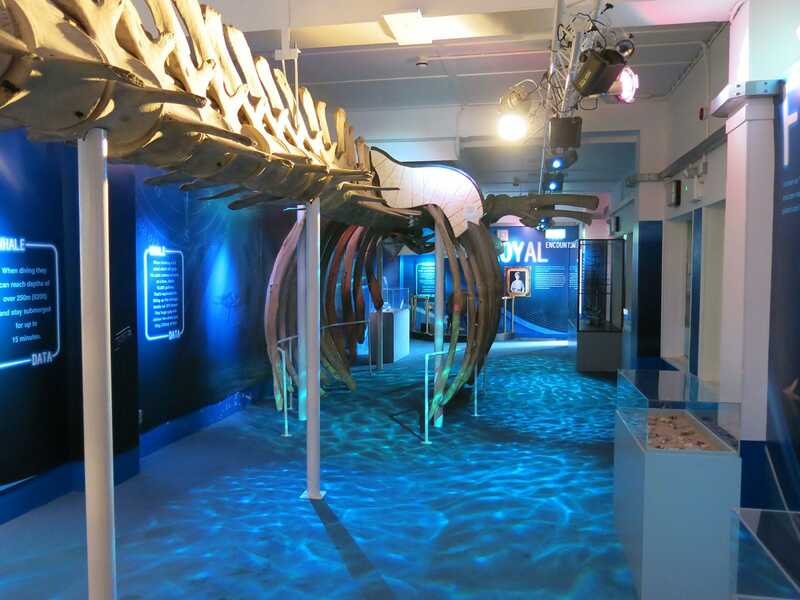 Our group decided to work our way around the park in logical order, starting with the Hall of Mirrors and an educational exhibit featuring the skeleton of a whale that has been a staple of the park for almost its entire 175 year history. There was no shortage of reading material for those who wanted to learn more. At the exit there was a full bodied whale in fiberglass form that visitors could walk through, and a series of random water jets to make things interesting. We followed a path past the coaster into Nurseryland, a section of the park featuring a variety of different models from children's stories and rhymes. We spotted references to Humpty Dumpty, The House that Jack Built, and The Old Woman who Lived in a Shoe, as well as a wide variety of magical toadstools and for some inexplicable reason a bald fiberglass priest who, it was suggested, bore some resemblance to me. Though the comparison wasn't exactly obvious I agreed to sit next to him and was promptly surrounded by about twenty people, all of whom wanted exactly the same photograph for their personal amusement. Our next stop was at Restricted Area 5, a dinosaur walkthrough built around a steep hillside path that included a wide variety of life size animatronics and quite a bit of oddball humour. One fence had a High Voltage sign set above another at ground level stating Low Voltage. Another sign advised against breathing in dinosaur poo, as it was hazardous to health. Yet another advised of the need for a T-Rex keeper, advising that the position was for short term employment only. The presentation of the area was excellent, leading The War Office to declare it the nicest area of the park. The Crooked House had some fairly elaborate scenes. The first room was an occupied bedroom notable for its massively oversized alarm clock and mechanical typewriter. The next room had a woman wrapped in a towel standing in front of a sink with two running taps and an open medicine cabinet. The third was the strangest of the lot, with two side by side toilets ("his and hers") sharing a common cistern. A pair of newspapers were on the ledge directly behind them, with headlines reading Torture! and Success! A final scene featured a kitchen whose sole foodstuffs were rice, tea, chocolate cake, and bananas, suggesting a fairly limited range of possible recipes. There were several animatronic creatures in The Musical Pet Shop crooning their own version of Up a Lazy River with minimal regard for tuning. We noted a variety of for sale signs for such items as elephant memory pills, toads (holes extra), flea powder, and horse shoes of all sizes. The animals also had their own creative advertising, notably the canaries that were "going cheap". A brief detour into the Cask and Weevil vortex tunnel led us to Rumpus Mansion, a substantial walkthrough that was one of the highlights of the park. A series of signs told the story as we approached; a fine house used by the island's lords and ladies had been taken over by bogarts, brownies, and elves, causing the humans to flee. Though nominally a haunted house the twenty detailed scenes were not frightening in the least; instead it looked like the various creatures were having a great time. 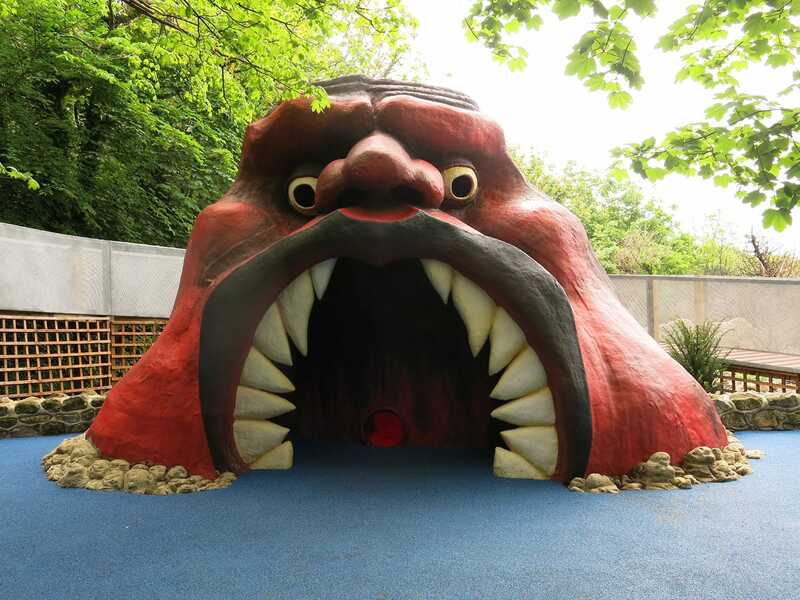 It was somewhat curious to find an attraction named the Mouth of Hell at a children's park, though things became somewhat clearer when we approached and discovered it was a slightly terrifying giant head that small children could crawl inside. There were stairs inside that provided a lookout tower through its eyes, though I was far too big to climb them. From there we wandered into Smugglers Cave and The Weather Wizard, a walkthrough where we passed through all four seasons in the space of a few minutes (which wasn't difficult to relate to as a life long resident of Ireland!). We found ourselves running a little short on time, and accelerated our pace for the last few sections of the park. A stereotypical western Cowboy Town led to a life size game of Snakes and Ladders (closed today) and Fairy Land, where a sign to count the fairies earned more than a few giggles given that we were travelling with a large group of coaster enthusiasts. The unintentional references continued at our last stop, the Valley of the Dodos, where a small flock of animatronics bid us adieu. Pirates Cove Fun Park is part of a small collection of amusement rides located on the waterfront in Shanklin next to an adventure golf course and a variety of fast food restaurants. It was interesting to see just fourteen of the twenty-five club members present riding Captain Jack's Runaway Train (#2238), clearly separating out the unapologetic credit whores from those just out to have fun. That being said, the ride was fun; with a full train of likeminded people the double helix ride became a hit, with the only negative being a nasty kink in the track at the bottom right hand corner of the layout. We were given ten laps, much to the amusement of everyone standing on the ground.